Come summer and the markets are flooded with an abundance of the glorious fruit,mango. I have been looking for new recipes using mangoes,away from the monotony and I found one dessert recipe,Aam Ki Kheer,which is new to me that I had tasted at my friendâ€™s place recently. In the South we call kheer as payasam and this creamy fruity dessert is prepared on the same lines we follow to prepare payasam/kheer and is pretty simple. I have been wanting to try it ever since I tasted it and today I finally got down to preparing and also present it for JFI â€“ Mango Event (Jihva For Ingredients) started and hosted by the lovely Indira of Mahanandi. I followed my friendsâ€™s recipe except for making some changes to make it a low fat mango dessert , by reducing the sugar quantity and substituting the whole milk and condensed milk with low fat milk. I also added a few pieces of ripe mangoes to the payasam for variety, for the feel of that natural fruity sweetness and to intensify the mango flavor. Its simple heavenly, the feel of biting into the mango pieces in between the creamy smoothness of the payasam. This dessert is best made not too sweet or rich, taking care not to overpower the flavor of the mango and to allow the natural flavor of the ripe fragrant mango to come through. Aam ki kheer which is served cold, is prepared by swirling in ripe mango puree or pulp into a mixture of sweetened thickened milk in which rice has been simmered till soft and garnished with cashewnuts and kismis giving it a wonderfully fruity flavour. Soak rice in water for 15 mts. Bring milk to a boil in a non-stick saucepan.Drain water from the rice and add to the boiling milk.Reduce heat and let the rice cook,stirring continuously till the rice is soft. Now add the sugar and go on stirring till the mixture thickens.Remove from heat and cool. Fry the kismis and cashewnuts in a tbsp of ghee till light brown and combine with the cooked rice. Swirl in the mango puree,salt and cardamom pwd.Garnish with cashewnuts, kismis and mango pieces.Serve chilled. The original recipe called for the use of whole milk,1/2 cup of condensed milk,1/2 cup of sugar ,mango essence (3-4 drops),pinch of saffron and almonds. A great melt-in-the-mouth summer treat with mango flavor, along with the creamy texture produced by sweetened cardamom flavored rice , makes this fruity dessert pure comfort food! My entry to the JFI â€“ Mango event hosted by Indira of Mahanandi. excellent sailu:) congrats for ur new home:) roju mee site chusi sailu emayaru anukune daani . Adire .. adire .. mee kotta site adarahooo !! Awesome layout … neat and sweet!! Welcome back ! Congratulations, Sailu. Your site layout looks fabulous, particularly I like the head bar design. Whoever designed it did a good job. Thanks for participating in JFI-Mango event. Mango payasam looks delicious. Sailu ur new website looks neat. I liked the title bar. 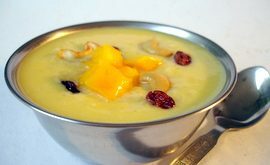 The mango payasam looks yummy, i have never tasted it before. Thanx for the recipe. I love your new home. Congratulations. Now I’ve updated my link to your site so people who drop by mine can come here for a visit. Your new home is beautiful, I absolutely love the dolls in the header. Payasam looks yummy, I would say perfect entry from your new home. What a beautiful new website! Can’t wait to see your new dishes….! Lovely sailu..and good to c u back. This is a wonderful thing to happen to ur blog..Congrats on moving to ur very own site. Its just wonderful. And the template is just amazing. I first thought it was just the tamplate change but then looked to see if u had moved from blogspot to typepad/wordpress like a few others lately. But Wonderful to see a ‘dot com’ there. I just love the title banner and the blog separators. reminds me of the ‘rangoli’ border designs. 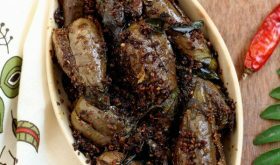 Happy Blogging…looking forward to a whole lot authentic Andhra recipes from u. When a AP friend of mine asked me what I wanted from India, I asked for Kondapalli dolls!! She brought back a DasaAvatar set that is just so lovely. Fantastic new look, Sailu! Congratulations. I missed your recipes the past few days…now I know why you dissappeared! Looks fantastic, and low fat too, just what I could use this week! Nice to see your own website with andhra touch .Mango payasam looks yummy.Due to some technical pblm i couldnt see your website . I like the dark color bar on the top of the page which elivates the rest of the page. Nice thinking and i like the doll which you used in pepper rice. Thank you,Vineela.Those are the famous hand-made Kondapalli dolls craved out of light wood. Nice to see your site. Congrats!!! Congratulations on your new home, Sailu. I was wondering where you were hiding all these days. You were busy doing up your new place! Great work there! Btw, I have updated my blog roll. Your Payasam looks great too. Hi Sailugaru, nenu intaku mundu oka sari comment raasaanu, mee website ki professional look isthe chala andamga untundani. Ee look chala bagundi. Andhra bommalu pettadamu tho chala kala vachindi.Chala rojulu nunchi emi post cheyaledemita anukunnanu. Ee work lo busy ga unnarannamaata :). Frequent ga manchi manchi vantalu chesi, andamaina photos tho maa andarini santhoshaparustarani akankshistunnanu. Sailu: Was wondering about this long absence and here you go with this beautiful domain of yours. Absolutely beautiful.. love these dolls and goes into my next Indian shopping list :)!! Good recipe to start with.. in your new domain! Awesome space! I love the layout. I will be sure to make this for my mom! Awww……Sailu! I found you finally! I have been wondering about your disappearance and checking your blog daily. I was eager to know what you made for Jihva. Just now I found your entry at Indira’s website, clicked on it, and reached here. Your new home looks wonderful, and so is mango payasam. Your new site looks great and I will still have a lot of pleasure visiting it on a regular basis! Keeep up with the good work! Wow Sailu, beautiful new home & a delicious payasam. Congrats to u. Keep up the great job. Hi Sailu … Nice move ..and neat site! Missed your posts for quite sometime!! Sailu – Congratulations on moving to your new home! Looks fabulous. Love your new site Sailu! Glad to know your guests enjoyed the dish. Its one of my favorite mango desserts that is quick and easy to make. Ur recipe is nice. I too will make it a grand one. I have a doubt. Ur recipe is perfect. 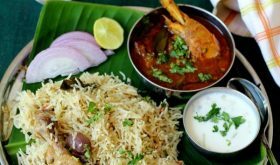 Can we make the recipe with semiya rather than rice? Sure you can use semiya, Sudha. can i omit salt and make and btw what is the purpose of salt here? Salt vesthe palu virigipothayi kada? pls reply bak when possible. You can omit salt if you want, Madhavi garu. This query is not abt food, but abt the arts and craft items that one could find in Andhra. I was going back and forth in your blog to find this piece of information abt kondapalli dolls. I have a dasavathar set and set of 5 ladies (from ascending to descending order). My friend is going to Andhra, and asked me if i need any items from hyderabad. i am not sure what to ask, but i love love deocorating home with south indian touch. I would love to have something of that sight.. will you help me in pinpointing/name some best looking items in kondapalli dolls collection or any other! Thanks a lot in advance! 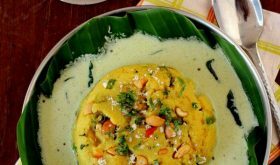 We are from vizag too.I like your recipes and I have a question about payasam. 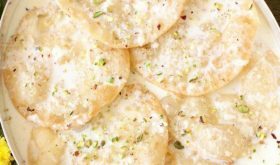 Can we use tinned mango puree mixed with sugar like kesar, ratna brands etc for making this recipe? We live in us and we couldn’t find ripe mango puree. Thank You. Hi Vijaya, Nice to meet another Vizagite. :) Ella unnaru? I have never tried with tinned mang puree, Vijaya. You will have to try it and let me know how it came out. Reduce sugar quantity in the payasam. Tried your payasam today. It was really lovely and easy to make. Thanks for sharing. 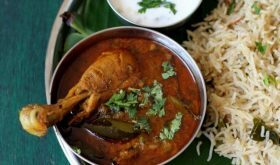 I am a newly married female from vizag currently in bangalore.To be frank i am very bad at cooking. but ur site has changed my image entirely. I tried Chettinadu chicken first and flattened my husband. He keeps calling his friends home during weekend and i keep trying recipes from your blog. Now everyone thinks i’m a great cook. Thanks to you first. i really love your receipes and the way you present them. I wish to see you. If you dont mind can you add ur snap in the home page? Perfect summer dessert and very quick to make. Tried it out today ,only change was almonds instead of cashews .Love your recipies. very very nice site. congrats!